Last night I had a dream that was SO boring, I was actually mad at my imagination. I won’t bore you with all the details, but a majority of the dream was me on the phone with an airlines customer service rep trying to change a flight. I’m not kidding. Just me, sitting on my couch, trying to change a flight to a later time. Huh? That might be the most boring thing I can think of. These are supposed to be dreams! Why can’t my imagination take me somewhere tropical like Hawaii for a day on the beach? Or have me win the lottery and going on a major spending spree? Or flying? 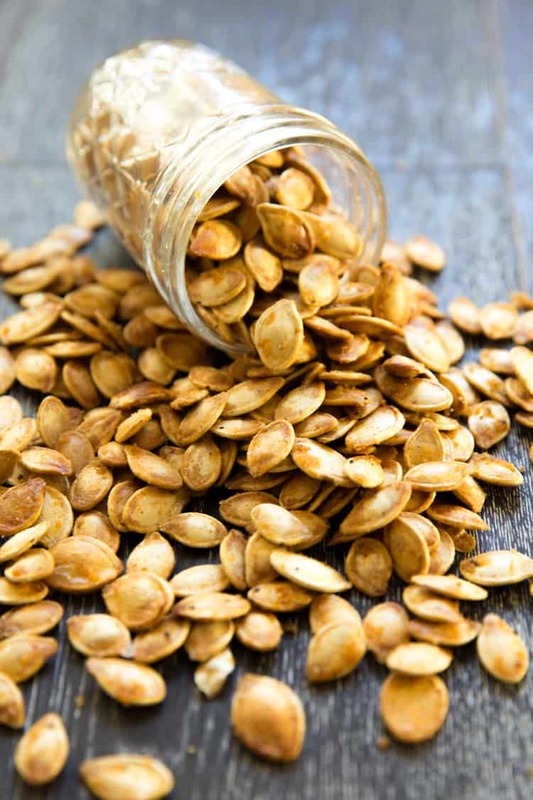 One thing that isn’t boring are these roasted spicy seasoned pumpkin seeds. Shawn gets so very excited when pumpkins start showing up at the market. Not because he can’t wait to carve them, but because he can’t wait to hack in to them and pull out all the seeds for me to roast. He will gladly sit there for over an hour scooping out pumpkin after pumpkin, and separating all the membranes from the seeds so I can roast them up for him. I used to do just a plain salted roasted pumpkin seed, but one day after making these spicy seasoned pretzels (which is actually one of the top viewed recipes on my blog), I thought the same seasoning mix would be delicious on pumpkin seeds. That October, when I bought about 8 pumpkins after Halloween when they went on sale, I experimented and made my first batch of spicy seasoned pumpkin seeds. Shawn FLIPPED out! They made basic roasted pumpkin seeds seem, dare I say it, boring. These roasted spicy seasoned pumpkin seeds get all their flavor the perfect mix of lemon pepper, garlic powder, salt and cayenne pepper. The flavors are really similar to Chex Mix Party Mix, so if you love that you’ll love this. Be sure to hang on to all your pumpkin seeds this year and whip these up! In a microwave safe medium size bowl, melt the butter for 30 seconds in the microwave. Add in the lemon pepper, garlic powder, salt and cayenne pepper. Stir to combine. Add in the pumpkin seeds and toss so all the seeds are evenly coated. Spread the seeds out in an even layer on the baking sheet and roast for 1 hour, stirring the seeds halfway thru. Allow to cool for a few minutes before eating. Will keep in an airtight container for 10 days. After you rinse the pumpkin seeds, they will be a little wet. That’s ok, they’re fine to add to the butter when they’re still a little wet. Don’t worry about drying them. Hahaha! I’m not gonna lie, I was reading that and thinking “wow I wish my dreams were that boring” and FYI flying dreams are SCARY. Seriously, once in one of my flying dreams I almost flew right into a building! LOL. And about these pumpkin seeds, WOW I have so got to hop on the fun-version pumpkin seed wagon. As in, jazz ’em up with some spices. Mine are usually so dull and boring, so I’m definitely gonna have to try out your fun version! I’m just like you husband, Natalie! I absolutely love carving pumpkins just to roast the seeds! It’s one of my favorite things to do, and I love coming up with new spices to season them with. This version sounds amazing! I haven’t carved any pumpkins yet this year, but I’m definitely going to try out this recipe when I do! Smka-cdab what I was looking for-ty! That seasoning mix sounds delicious! I have never done anything other than salt on them. I hate cleaning them so much, sometimes I just throw the seeds out. Isn’t that awful? Nat, that’s a very good recipe! This version sounds amazing! I haven’t carved any pumpkins yet this year, but I’m going to try out your recipe when I do for sure! Have a awesome week my friend! LOVE roasted pumpkin seeds. That is my favorite part, too! Now if I could just get my own pumpkin seed picker, I’d be set! I love roasted pumpkin seeds, and I your spicy take is a fresh twist! More flavor? Always! Ooooh I love me some pumpkin seeds. I can’t wait until we carve our pumpkins so I can make some! I love the flavors you used and I love chex party mix so these must taste great, I have to try these out. Hi sweet Natalie!! I feel so detached from your blog and life….I don’t like it lol! Boring dream lol sometimes dreams are strange aren’t they? They make completely no sense. You are not alone dear!! We all have them! I’m obsessed with pumpkin seeds!! Usually I just like them salted but thats basically because that’s all my mom ever did growing up and I still loved them! Need to try this! Thanks for the recipe, hope all is well :) Trying to get back into the blogging swing of things lol. the seasoning sounds delicious! beautiful pictures too! Haha it makes you wonder what hidden meaning there is behind dreams like that. On the bright side at least it wasn’t a nightmare, right? I had pumpkin seeds for the first time last year and they were amazing. I love how you have recipe to perfect your own. Yay! Happy fall! Haha you are too cute girl. I would rather have a boring dream than a scary dream that’s for sure. But a hawaii beach dream does sound perfect though :) Oooooh, my husband loooves carving pumpkins to roast the seeds. He is going to flip over this spicy seasoning – it sounds amazing girl! Oh I hear you on boring dreams. Sometimes I have dreams that I’m at work. Usually nothing bizarre or dramatic is happening…just a regular day of work. SO BAD!! Waking up to go to work the morning after is the wooorst. You’ve convinced me – I need to buy a pumpkin immediately! Gah I bet we would LOVE snacking on these! These look lovely! Haven’t had pumpkin seeds in awhile. Oh I’ve so been there. Boring dreams are such a waste!! Way better than the awful one though where your dog dies or something. Hate those even worse. These pumpkin seeds look amazing!! I bet they would be so good on a salad. YUM! 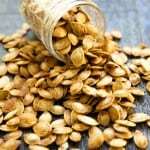 I love the spicy flavors of these pumpkin seeds! I’ve had some pretty strange dreams lately, nothing scary or sad, but ones where I wake up and wonder what the heck I was thinking about. I guess boring and weird dreams are better than nightmares. And also, I need a Shawn/pumpkin scooper, because I always get kind of grossed out by the scooping. But these seasoned pumpkin seeds look amazing, totally worth the scooping! Definitely going to have to try these! I need to try these. You make carving a pumpkin, scooping out and cleaning the seeds so easy (wonderful video) :) Hehe, whenever I do it I end up finding pumpkin everywhere! It is always worth it for the freshly roasted pumpkin seeds though! Love the spice seasoning on these – can’t wait to try! Pinned onto my Pumpkin Board! I make my own pumpkin puree every year and one of the main reasons is because of those pumpkin seeds!!! I just love roasting them and am always on the lookout for new recipes – I cannot wait to try this one ;). I would have been so happy with a boring dream last night. I had the most vivid and tiring dream involving chocolate pie, another food blogger, and breaking a leg, ha! I just roasted a pumpkin a couple nights ago and I ALMOST saved the seeds to roast… but then I got lazy and threw them out. Now I’m having serious regrets!! I love making pumpkin seeds! My housemates and I are going to be pumpkin carving soon – this is definitely what I’ll be doing with the seeds. Sounds so delicious! Oh Natalie, I’m so glad I’m not the only one who sometimes has boring dreams. In fact, I think I usually have boring ones!! Haha! Either that or they’re stressful – definitely not Hawaii-type dreams. 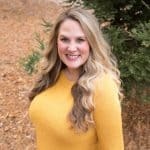 Your husband sounds very useful – can he be hired out to do any kind of boring, repetitive job??? Anyway, love the flavoured pumpkin seeds. A nice healthy snack to have around the house! 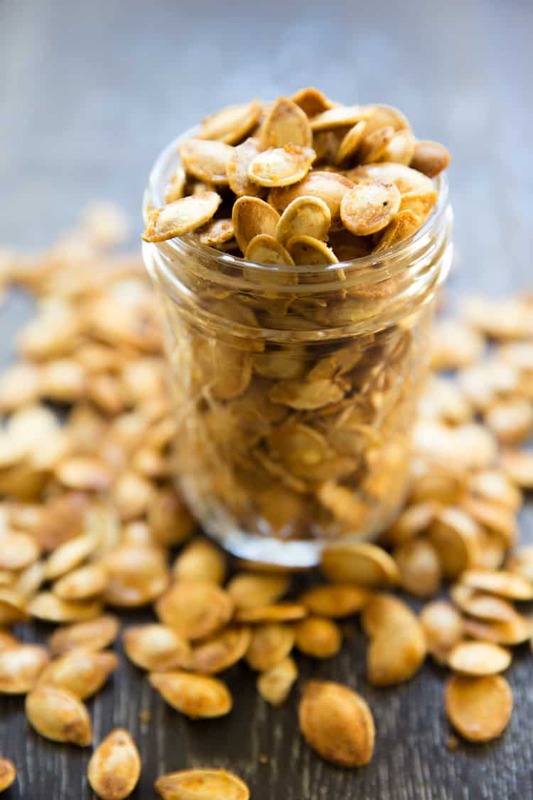 We love snacking on pumpkin seeds! These would disappear in no time! My wife can’t wait to rip open the giant pumpkin we have sitting on our front stoop to get at the seeds. I think I’m going to need to show her this… she’ll def be making it over the weekend! Happy Halloween!